Why not combine two focal points and install a TV above a fireplace? The 572 TV contemporary modern gas fireplace is a masterpiece of form and function. This elegantly simple wall fireplace and television combination brings two room focal points together to make a beautiful, contemporary fireplace. 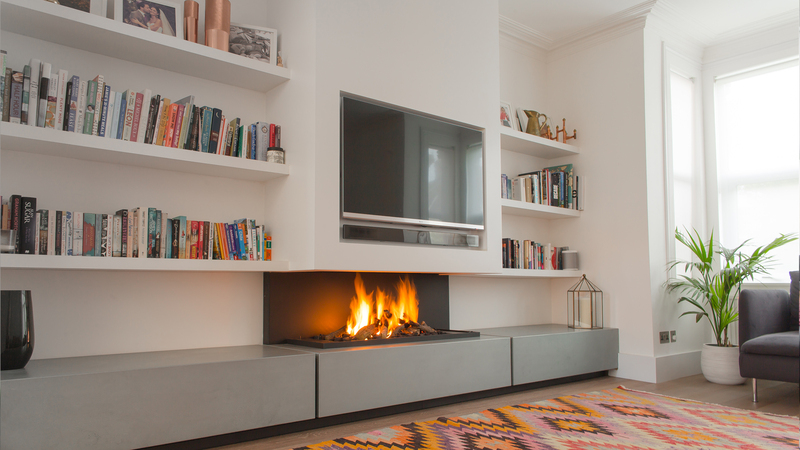 The minimalist design with exceptionally realistic and modern gas fire is ingenious in its conception. The seemingly floating, wall hung canopy means the fire can be viewed and enjoyed from 3 sides. The canopy is heat insulated and along with the TV recess is custom designed and made according to the TV size. The canopy is finished to specification i.e. colour and material. Heat protection of the TV is imperative when designing this fireplace and if this is not adequately dealt with it can shorten the life of the TV. The base long which adds a further design feature to this contemporary wall fire, can be made as a piece of functioning furniture and be used to house audio visual equipment etc. The base is custom made to size and is manufactured from wood or steel depending on preference.